After all that has transpired–the sudden chaos and smoke and upheaval; the loss and sorrow, the immediate doing of what needs to be done–there comes a time when the world begins to right itself. It seems possible to move outward and regain the rhythm of the season. It is time for the trail crew to get back out on the trail. We made a plan to work south on the Pacific Crest Trail from Hart’s Pass, covering thirty miles in three days. Heavy gray clouds hung over the peaks. The weather forecast was no deterrent and our eagerness to go in spite of the rain showed how much we longed to be out there. I was delayed by an administrative issue so the trail boys had a head start. Pulled on my rain gear and backpack at noon and set off to find them. I hiked through fog and dripping trees, stopping to gape at the landscape when the clouds swept aside long enough for me to glimpse long sweeping slopes dropping into creeks far below. The water-soaked colors are so rich: the deep blue-greens of subalpine fir spires; the gold-laced greens of meadow grasses; the startling scarlet leaves of low huckleberry bushes. My thoughts wove in and out of memories of the past few weeks, the experience of bearing witness to grief, of standing with others in mutual support, of being a member of a community. The word resilience comes to mind. A few backpackers passed me, all heading north. Pacific Crest Trail hikers, only two days away from Canada and the end of their big adventure which started at the Mexican border months ago. I wondered where the trail crew was. Somewhere ahead of me, I heard cackling rising up through the mist. What the heck? A group of high school kids out on the trail? I passed three packs lined up on the bank, neatly covered against the rain. I had found the boys. 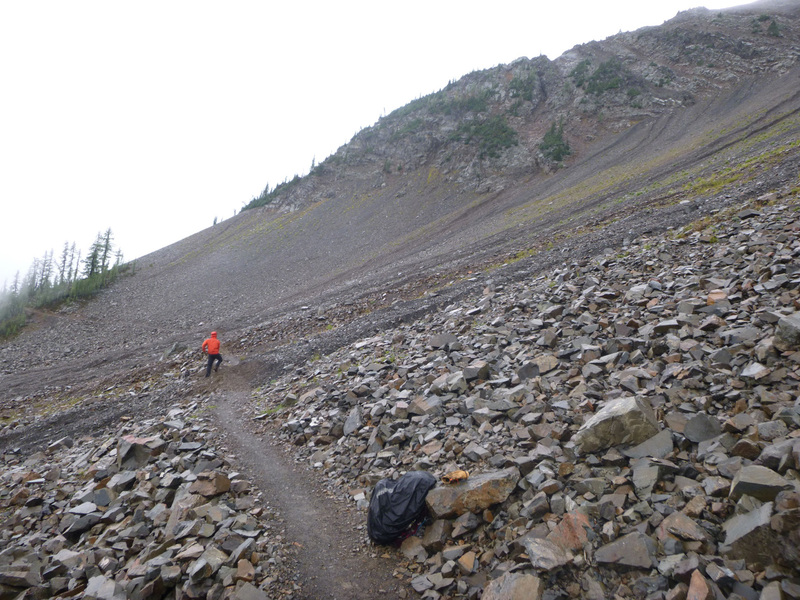 They were digging their way through a series of washouts that had dumped mounds of scree and rocks on the trail where it crosses the backside of Tatie Peak. Smeared with mud, they joked and howled with laughter as they worked. My heart lifted. We were getting back to normal. When dirt people can go out and get dirty, the world is right. When we can discharge tension and sadness by being goofy, we begin to recover from hard times. We camped separately that night. They opted to stay in a canvas wall tent back at the trailhead. 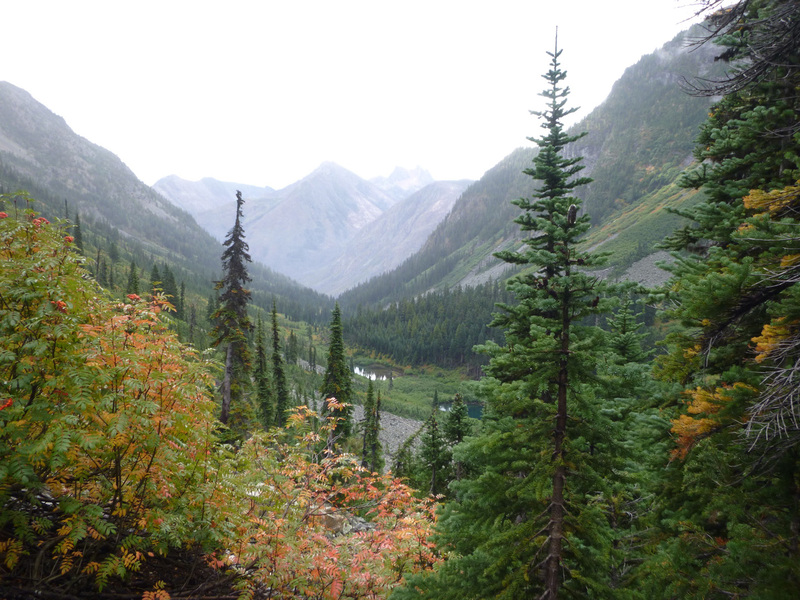 I hiked another four miles south to Glacier Pass, crossing over a ridge in a wild wind then dropping down a steep slope into the timber. Pitched my tent in the rain and cooked a quick pot of supper in the twilight. My clothing was soaked, and I crawled into the tent to change into dry long underwear for sleep. Nodded off to the sound of drips on the tent fly and awoke to the same. Laid in my bag for a long time making up my mind to get up and pull on my wet clothes and boots. As usual, my body decided before the rest of me. I was hungry and thirsty and had to pee. By the time I had packed my wet gear, the clouds were tearing apart and bits of blue sky were revealed. If there was a hope of spending a few rain-free hours on the trail, I was game to go on. The trail led down into Brushy Creek. When places are given a name like Brushy Creek, it’s usually for a good reason. I was pleasantly surprised to find that the prodigious shrubs had been vigorously pruned away in the past couple of years. All I had to do was a little touch up with my small pruning saw. By lunchtime the crosscut saw team had caught up with me and we forged onward. After crossing Brushy Creek, the trail made a big turn and followed the Methow River through a broad valley to its headwaters below Methow Pass. The rain started again, and we kept finding logs to cut out of the trail. We finally found a minimal campsite as dusk began to fall. It was clear that we would not make it to Methow Pass before night. I confess there is consolation in being cold and wet in good company. It was easier to get up the next morning when I heard the others rustling around. The guys were anxious to go, so I hiked the next twelve miles alone and at my own speed. Through the fog I could see a dusting of new snow on the peaks all around. 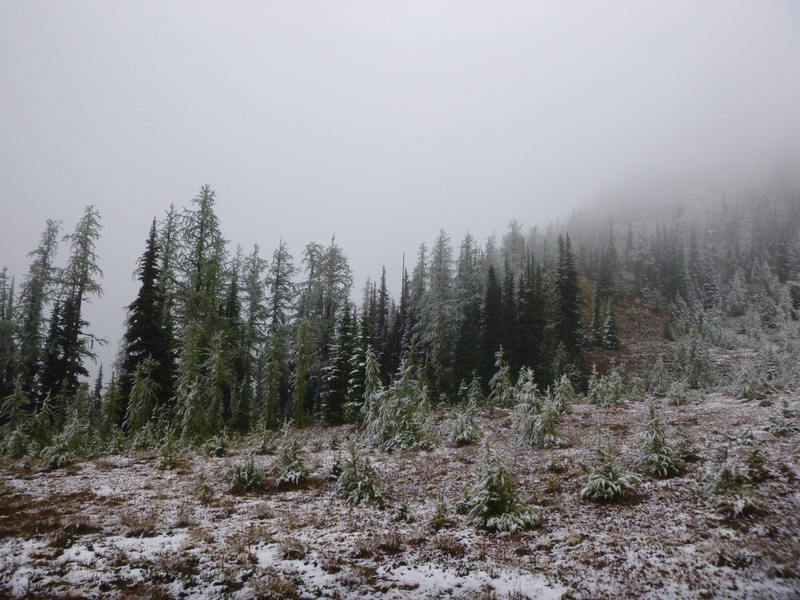 The fine rain turned to ice pellets then snowflakes as I ascended to Methow Pass. The top was slathered with wet goopy white stuff. Because I was warm from hiking, I was able to savor a sense of wonder about the dramatic weather. From here, I still had about nine miles and two passes to cross. I hiked steadily, stopping only to make notes about trail work needing to be done. The mountains here are granite tinted pink from iron. My mind boggles when I consider how old the earth is and that these rocks were once the continental crust of North America. Uplifted, tilted, smashed by microcontinents arriving from the west, glaciated numerous times, and now weathering back into particles. Decayed granite makes for a fine trail surface and my boots crunched along. I watched the clouds shifting and clearing, making shadow play on the valleys and slopes. 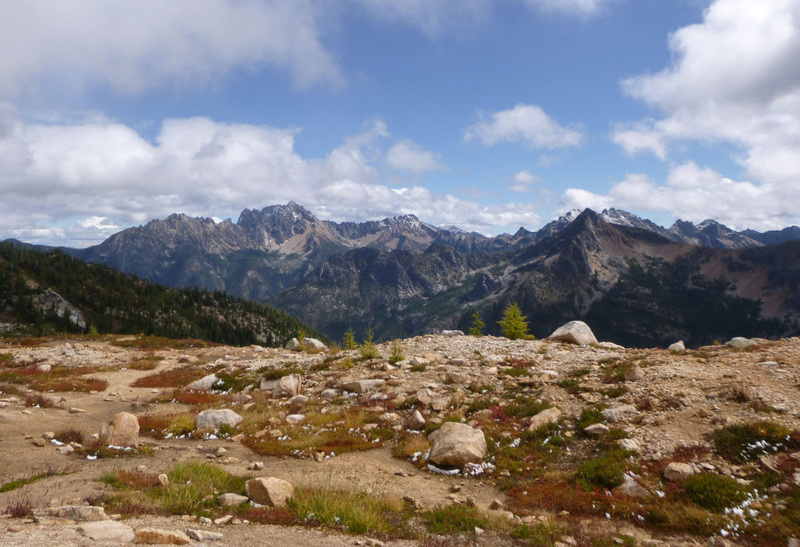 By the time I reached Cutthroat Pass, I could see clearing to the south and the ruggedness of the peaks all around. Groups of people had day hiked up from Highway 20. 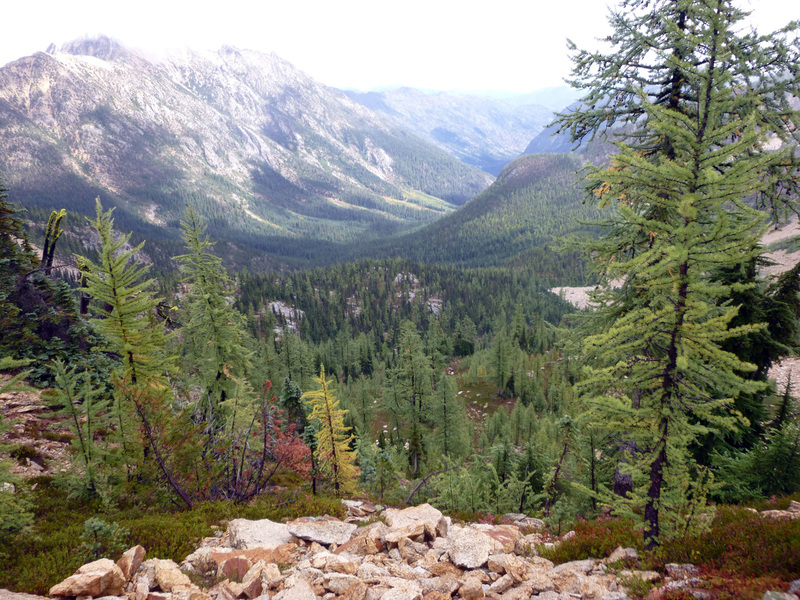 I sat on a big rock to eat some cheese and crackers, then launched down the switchbacks toward Rainy Pass. I guessed the trail boys were five miles ahead of me, having raced out of the woods at hyper speed because it had snowed. Before long I had to stop and take off my rain coat. It felt like a different world than the one I had woken up to. The appearance of day hikers and soon the sound of trucks on the highway meant that I was leaving the wilds. Somewhere below Cutthroat Pass the reality of returning to the built world penetrated and then there I was. The boys we shivering in the pickup, and as soon as my wet backpack was dumped in the bed we were off. It was a smooth re-entry, made easier by a cup of coffee and a sandwich from the Mazama store. The piles of notes on my desk and the backlog of emails seemed superfluous. What mattered was that we had gone out and come back in. Thirty miles of the PCT are logged out. The rain had rinsed the smell of smoke away, and cooled the shared shock of the past couple of weeks. We find our solace in all sorts of places, with all sorts of company. Or alone. We carry grief and confusion along with stoves and tents. Time is the only true balm, and time spent in wild places has value because of the effort expended to get there. If it was easy it wouldn’t be as effective. That’s what I tell myself as I repack my dry gear, and hold jewel-like images of long glacial valleys and jagged peaks and the soft open limbs of subalpine larches. I feel the aches of travel and welcome deep sleep. It’s good to go out and come back. Good to be on the trail. Thank you for this. Achingly beautiful photos. Wow! Deb, it’s been way to long since I’ve seen you face to face but reading your blog makes me feel like we just sat down and had a good cup of tea. Thanks, Pat. We should have tea one of these days. Beautiful. Been thinking about everyone over there and what a hard – heartbreaking summer it must have been. Glad that things are starting back towards normal and that you are able to get back on the trails and heal a little. We hiked this section of trail last summer – an amazing landscape – and we were also relieved to find Brushy Creek – brushed. Thanks, Dawn. It has been a challenging season, and going outside is so nourishing. A brushed trail is a wonderful thing. I love hearing about your adventures! I can be an armchair trail-crew-dude! Are there any minerals in brushy creek? Because……..
Because Mineral Creek is brushy?